I’m not a big fan of the International Monetary Fund, largely because the folks in charge oftentimes advocate toxic policies such as bailouts, higher taxes, and currency devaluation. But there are some top-rate economists working at the IMF, and the bureaucracy has published some good studies about the economic benefits of reducing government spending and others warning that tax increases can be self defeating (by the way, too bad we can’t get the Joint Committee on Taxation to also acknowledge the Laffer Curve). Now the IMF has a new study about the relationship between economic growth and different types of taxes. Those finding are interesting, and I may even write about them in the next few days, but I want to focus on some amazing data from this research that shows exactly why proponents of limited government should resist the value-added tax. 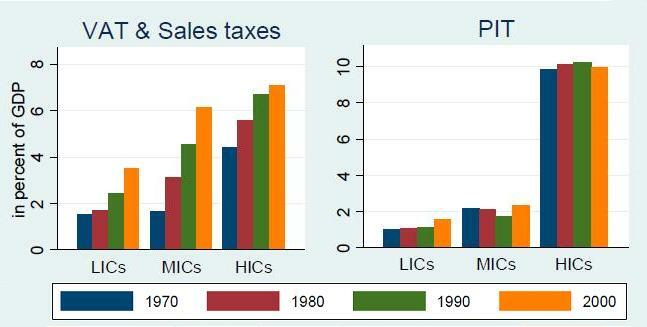 These charts are taken from page 10 of the IMF study and they depict changes, over the past several decades, for both personal income tax (PIT) revenues and consumption tax revenues, both measured as a share of economic output. The charts are divided to show trends in low-income countries, middle-income countries, and high-income countries. These are remarkable numbers. They basically show that politicians have been unable to squeeze more money out of the income tax. We don’t know if that’s because of the Laffer Curve, tax competition, electoral resistance, or all of the above. But we can say with considerable confidence that the income tax has not been a money machine over the past 40 years. I’m not saying it’s a good tax. Far from it. The income tax is unfair. It’s punitive. It’s discriminatory. It’s corrupt. And, when it was first adopted, it did generate a big new pile of revenue for the politicians. But that was 100 years ago. In recent decades, by contrast, it hasn’t been a piggy bank for statists seeking to expand the burden of government spending. The data for the VAT and other consumption taxes, by contrast, shows just the opposite. With each passing decade, the VAT burden climbs, and that’s true for nations at all stages of development. This is one of the reasons why a VAT would be a disaster for the United States. Politicians might make promises about repealing or reducing other taxes in exchange for a VAT, but it is a 99-percent certainty that politicians would pull a bait-and-switch. We’d still be stuck with the awful income tax system and the IRS, but the crooks and clowns in Washington would have a new source of revenue to feed their spending addiction. Isn’t that wonderful? We’d be taxed when we earn our income (often more than one time), and then taxed again when we spend our income. Just like Europe. Here’s my video explaining why a value-added tax would be a fiscal disaster. One final point. I don’t care if you like Mitt Romney or dislike Mitt Romney. But, given his less-than-sound views on the VAT, I want everybody to be prepared to hold his feet to the fire if he happens to prevail on November 6. P.S. You’ll be delighted to learn that the pampered bureaucrats at the IMF get tax-free salaries, just like their cousins at the OECD and the rest of the international bureaucracies. P.P.S. I just shared these a few days ago, but if you didn’t get a chance to see them, you can enjoy some good anti-VAT cartoons here, here, and here. I totally am against a VAT I think getting the 50% that don’t pay taxes to pay even a little something will help greatly. Every town and city and state is about to increase its taxes in one form or another. If the Feds go on the bank wagon, we will be taxed right out of helping the economy. We won’t have a dime to spend on anything. Getting Obama out and Obamacare is essential.